Fruit and vegetables are full of vitamins, minerals, and fibre which help to keep your child healthy. 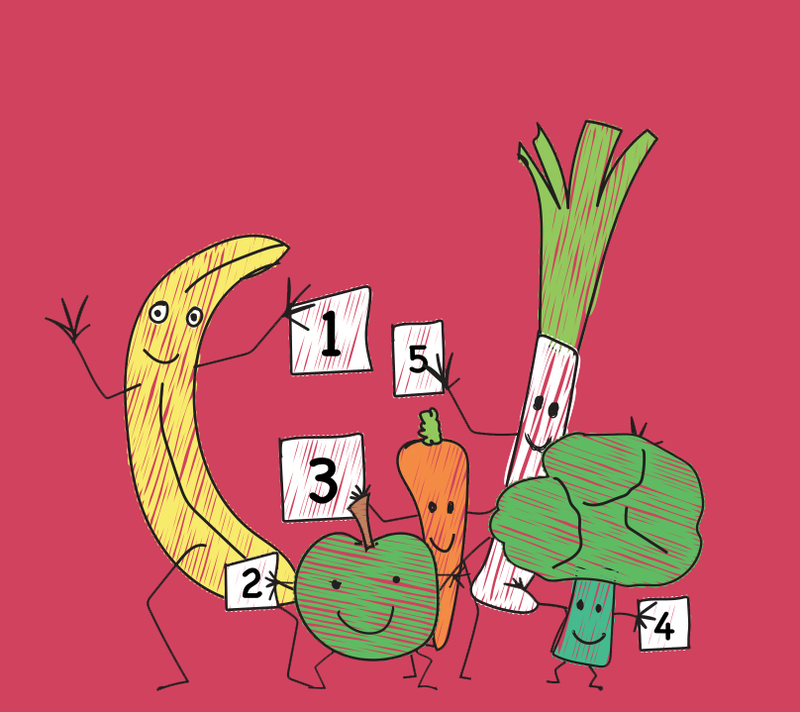 By the time your child is 12 months old, aim to give them five portions of different fruit and vegetables every day. One portion should fit into the palm of their hand – so it might be a slice of apple for a toddler, but a small apple for a four-year-old. Fruit and vegetables are like any other food. Avoid presenting foods like biscuits and cakes as nice or a treat, and vegetables as something less enjoyable or different. For more information on how to encourage children to eat 5 a day, click here. If your child sees you eating and enjoying a variety of fruit and vegetables, they’re more likely to join in. They might refuse certain fruit and veg at first, but keep trying. If they see everyone else in the family enjoying them, they’ll often change their mind. Offering children rewards like ice cream in return for eating their vegetables can be tempting. But it doesn’t work in the long run. It teaches children that vegetables are less appealing. Children like food less in the long run if they have to be rewarded for eating it. Encourage them to choose what fruit and veg they’d like. Take your child shopping. Let them see, touch and smell the food you buy. Let your child wash and prepare fruit and veg too. They can have fun making a fruit face or kebab for them to eat. Instead of looking for new recipes, add vegetables to meals you already make. Try adding carrots into a pasta sauce, for example. Always keep a bowl of fresh fruit handy. And keep some veg such as cucumber or carrot sticks in the fridge for a quick snack. Frozen, tinned or dried fruit and vegetables can be just as good. They’re often cheaper and last longer than fresh, which is an added bonus. Just make sure you choose tinned fruit or vegetables that have natural juice or water, with no added salt or sugar. It’s normal to be a fussy eater when you’re a child. We all turned our noses up at sprouts or broccoli once – some of us still do. It’s just part of becoming independent. All you have to do is make them available, and show that you enjoy fruit and veg too.